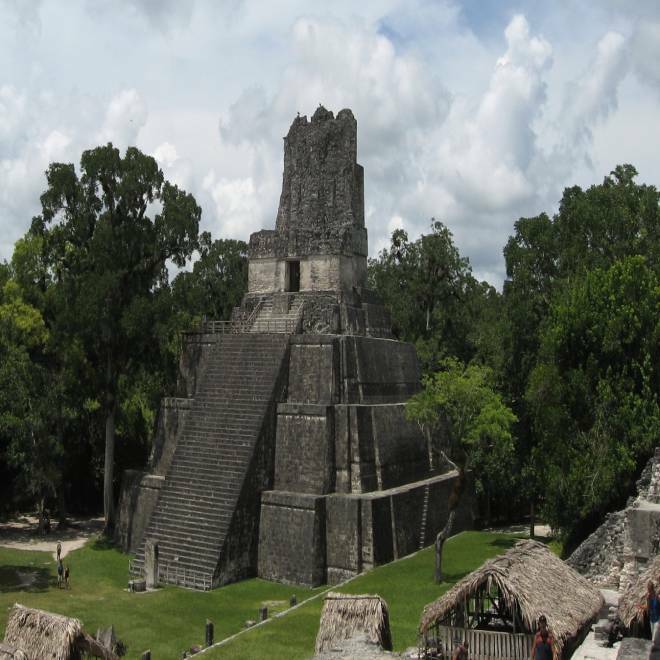 This temple in the Kingdom of Tikal is one of the most prominent of the Classic Maya Period. Scientists have long assumed that the Classic Maya civilization was done in more than a millennium ago by a series of droughts, but now they say natural records suggest those droughts were "modest," with no more than a 40 percent reduction in rainfall. And that, in turn, suggests that similarly modest climate changes over the next century could have a not-so-modest effect. "What seems like a minor reduction in water availability may lead to important, long-lasting problems ... Today, we have the benefit of awareness, and we should act accordingly," Martin Medina-Elizalde, a researcher at the Yucatan Center for Scientific Research in Mexico, said in a news release. The study — conducted by Medina-Elizalde and Eelco Rohling, a colleague from the University of Southampton — appears in this week's issue of the journal Science. It addresses one of the big mysteries of Maya history: What caused a civilization that dominated areas of present-day Guatemala and Mexico in the year 800 to collapse by the year 1000? Deforestation and drought have figured prominently as the prime suspects, but just how dire did those droughts get? To shed additional light on the mystery, the two climate experts analyzed chemicals in lake sediments, marine shells and cave stalagmites to track variations in rainfall. For example, the ratio of oxygen-16 to oxygen-18 in a particular layer of mineral can tell you how much rainfall fell during the season when the mineral was laid down. Such variations can be read year by year, like tree rings. The elements in different layers of stalagmites in Yucatan Peninsula caves, such as this one, were analyzed to determine how rainfall varied through the centuries. The researchers found that there was indeed a deficit in rainfall in the period between the years 800 and 1000. But that deficit was modest, amounting to a 25 to 40 percent reduction in the drought years. Medina-Elizalde and Rohling assume that the droughts took the form of reductions in the frequency and intensity of tropical storms during the summer. "Summer was the main season for cultivation and replenishment of Mayan freshwater storage systems, and there are no rivers in the Yucatan lowlands," Rohling said in the news release. "Societal disruptions and abandonment of cities are likely consequences of critical water shortages, especially because there seems to have been a rapid repetition of multiyear droughts." In an email, Medina-Elizalde told me that "these droughts may not have been strong enough to cause by themselves the collapse of the civilization, but they were likely strong enough and persistent enough ... to cause major sociopolitical disruptions that ultimately led to the final outcome." "Let's imagine that today, from one year to another, major cities can no longer supply fresh water to a third of their populations. ... With no freshwater pumping systems, how would we keep producing agricultural produce and supplying fresh water to support the entire populations of these cities?" he wrote. Today, much of the Yucatan Peninsula's rural population still relies on summer rainfall to support their crops. Medina-Elizalde said access to fresh water isn't so much of a problem, thanks to modern pumping systems. But he noted that lower-than-average summer rains still "have fairly dire consequences" for local farmers. The current models from the Intergovernmental Panel on Climate Change predict that there could be annual rainfall reductions of up to 50 percent in the Yucatan Peninsula by the end of this century, Medina-Elizalde said. He and his colleagues are studying how such reductions might affect freshwater supplies in the region. "Some climate models suggest that local vegetation does contribute to increase rainfall significantly ... which would suggest that by preserving the forests, we are mitigating the impacts of climate change," he said. "Definitely, local governments need to start making serious efforts to mitigate and adapt to climate change in light of the forecast for the next decades." What do you think? Does this research merely add an interesting twist on a centuries-old story, or does it serve as a warning about our future fate? Please feel free to weigh in with your comments below.